State Rep. Jeff Perry introduced a bill to require proof of legal residency to receive tax-funded benefits. He has done so every year for the past few. But once again, House democrats killed the bill in its' tracks, again thumbing their collective noses at taxpaying citizens. Blogger Benjamin Hackett wrote: "...when other European immigrants arrived and were processed, there was a sense of connection with their purpose. That purpose: Make their lives better and prepare for their children’s futures. There was no Social Security. There was no welfare. There was no Medicare or Medicaid. There was only the individual and the fruits of his or her labor. Personally providing for one’s family was essential to daily life. If you failed to provide, and your neighbors proved less than charitable, you paid the consequences." Oh how things have changed. When Ellis Island was the beacon of entry into America, immigrants (legal) came here seeking religious freedom and the opportunity to make a productive and sustained life for themselves and their children. Parents made their children speak only English when in public as mastery of the language was correctly viewed as the key to future success and assimilation. Translation: Immigrants came to America TO BE AMERICAN. In modern America 2010? The vast bulk of immigration is illegal and originates from the countries of South America. And they know where to go for section 8 housing, food stamps and welfare and have no problem doing so. A blatant case in point is President Obama's own aunt Onyango living in taxpayer funded public housing in South Boston. Who among us could enter France illegally and end up in a taxpayer funded apartment for several years? It's estimated that between 70% and 80% of illegal immigration originates from Mexico. Ever wonder what Mexico's own immigration parameters are? From a Newsweek article: "As tough as the United States can be for workers who slip in from south of the border, Mexico is in a poor position to criticize. The problem goes far beyond the predatory gantlet of thugs and crooked cops facing defenseless transients like Moisés. There’s ample precedent in Mexico for just about everything the United States is—or isn’t—doing. Calling out the military? Mexicans may hate the new U.S. plan to deploy 6,000 National Guard troops on the border, but five years ago they cheered President Vicente Fox for sending thousands of Mexican soldiers to crack down on their southern frontier. Tougher laws? Hispanic-rights groups are enraged over U.S. efforts to criminalize undocumented aliens—yet since 1974, sneaking into Mexico has been punishable by up to two years in prison. 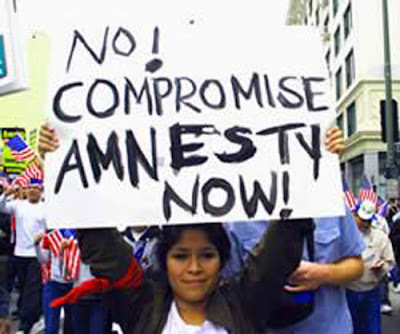 Foot-dragging on amnesty? Fox has spent the past five years urging the United States to upgrade the status of millions of illegals from Mexico. Meanwhile, his own government has given legal status to only 15,000 foreigners without papers." Mexican President Felipe Calderon said that "....Arizona's tough new immigration law is discriminatory and warned that relations with the U.S. border state will suffer." It's not an "immigration law" it's an "illegal immigration law". 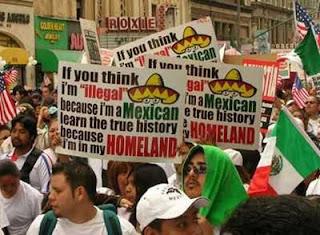 And because we believe that existing immigration laws should be enforced, that does not mean we're racists and bigots. Can there be any more intellectually dishonest argument? Those legal immigrants who have green cards must carry that card with them at ALL TIMES. Is that racist? If I go to the bank for a loan, I have to show valid ID and proof of residency. Is that racist? Back to the local manifestation of Boston's growing dependency/welfare state. The introduced bill to require proof of legal residence before taxpayer funded handouts are given is common sense, practical, fair and appropriate. But once again, Beacon Hill democrats show us how little they think of us and how much they favor those in this city illegally with their hands out. Did I mention that we're still in the midst of an economic "situation" here? Every State run program is under funded already. Even with the confiscatory taxation on everything that isn't nailed down. Yet, we have plenty of money to support those here illegally. Give me the days of Ellis Island immigration where there were no entitlement programs, no section 8, no food stamps, no hand-outs. Just people who wanted to be American and do so on their own. Jeer: Beacon Hill chooses illegals over it's own citizens. 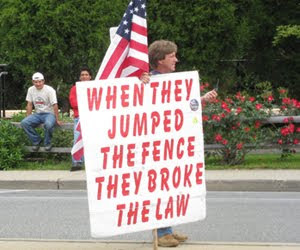 It is one of the bitter truth that when you have jumped the fence you have broke the law. And I am really impressed with the quote of this man written on the banner. Hello and thanks very much for reading. Difficult situation with no easy answers.